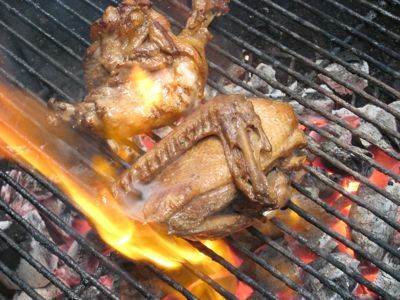 But I couldnâ€™t resist the desire to experiment further and decided to throw the quartered duck pieces onto a hot barbecue grill, just long enough to caramelize and crisp up the skin. This â€œdried outâ€ the surface of the duck as well as making it look spectacular. Served with some homemade acharra and the reduced â€œadobo gravyâ€ and served with lots of rice, it was surprisingly good and definitely a keeper of a recipe. The next day, we had some leftover duck that we shredded into small strips as one would do with chicken and pork adobo, and re-fried it until crisp with some of the leftover duck fat/gravy. I have to admit this last iteration was inspired by a dish that I spied but had not tried at Mamou, a restaurant I am about to post a review on. 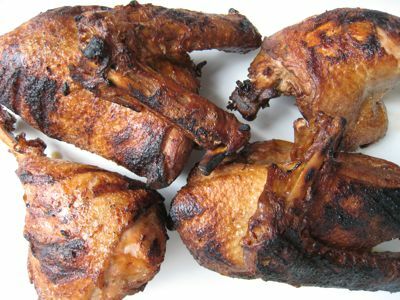 If you are a fan of duck (not everyone likes all that dark meat with a more complex flavor than say chicken) and adobo, you may want to try this recipe sometime soonâ€¦yum! 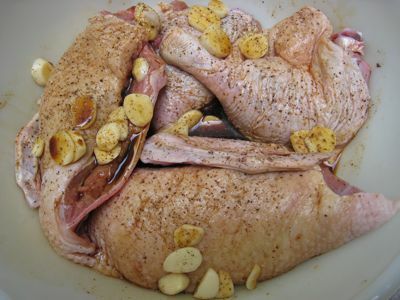 You should try making “patotin” with duck. 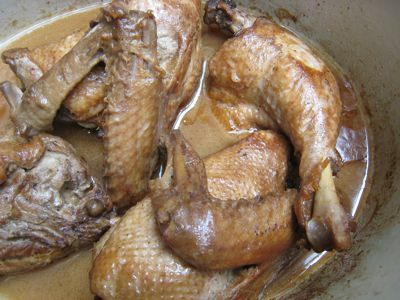 Traditionally, they cook the whole duck in “tuba” (coconut wine) until tender. I have tried cooking it in beer, sprite and pineapple juice and though not as good as the one cooked in tuba, is decent enough. You have to simmer it until the liquid thickens to a sauce. It was always great pulutan. thanks a lot for this duck recipe. sounds yummy with the atchara. 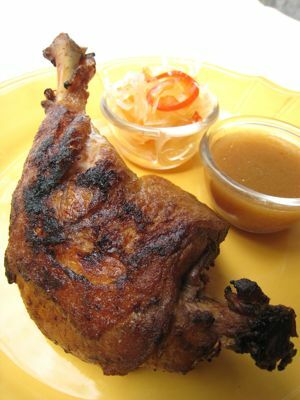 will try the grilled duck soon and maybe with adobong mushrooms on the side. I love duck so it is a definite must try. Thank you for the recipe MM. Thanks ajyoung- your post about snipes reminded me of my days when I was a cabin crew. During my domestic days, I always looked forward to adobo-prito snipes during our lunch/groundstop in Legazpi, Albay. I used to purchase small bottles of Bicol Express as well to take home and eat ‘with lots of rice’! MM- I bet the recipe and technique will work just as well with pugo (quail), and itik (native duck) Yum Yum! hi! would you know how much good, fresh duck is (in general)? any suggestions where i can get some? great recipe.. it’s something worth trying.. but i do have a question for MM, can you share a good recipe for achara? I remember my mom making them before but i totally forgot how the vinegar is made.. hope you can share some of your homegrown recipes for achara!! thanks! Hello Market Man, another way of cooking it is pinaupong itik or bibe. As far as I remember they cook the duck on top of salt inside a big pot. I also like canderetang itik as long as it has enough peanut butter and hot sauce. MM, you do like your duck! Have you ever tried roasting potatoes and onions in duck fat? Mmmm, now that makes a simple yet interesting side dish for just about anything. It sounds like using your left over adobo duck fat/gravy, instead of just plain duck fat, would bring this simple side dish up a notch. I’m trying this out! Oh, that sounds delicious — I’m a duck fan, myself! Your third duck dish and ajyoung’s comment reminded me of a dish I used to love in Bistro Burgos (an LJC resto that used to be on Burgos St. before it became a red light district), which was snipes cooked like crispy adobo flakes. Adobo flakes is one of my top Pinoy dishes, and to make it with duck just kicks it farther up the list! Haven’t tried this recipe before but will definitely do sometime soon! I also am a duck fan and almost every other day, I feast on crispy aromatic duck rolled up and eaten together in pancakes with sliced cucumber,spring onions and hoi sin sauce…I always have these delivered hot and fresh from a Chinese restaurant near my place,hehe… oh, and I also love their Cantonese roast duck! It’s really nice! rianne, if I ate duck every other day I would be 50 lbs heavier! Katrina, I LOVE snipes and yes, the crispy and chewing fried flakes are the best. But with duck it was a close second… F1foodie, yes, roasting or frying in duck or even better goose fat is superb. I did a dinner last Christmas that featured potatoes in goose fat… danney, I have never tried pinaupong itik, but now I am curious! kaye, I have a acharra recipe in archives, or google “acharra marketmanila”. nikka, I have never purchased fresh duck here but I understand they sell them in the Pasig market or from Pateros… Joey, I always see pugo eggs, but oddly I rarely see dressed young quail or pugo for sale, any ideas where to buy quail? jo, I hope the recipe works for you. ajyoung! arrgh, it is so hard to find snipes here…I have wanted to make adobong snipes for years…its Mrs MMs favorite! Mrs. M, adobong mushrooms sounds good to me. benchorizo, that version sounds great as well! I LOVE duck but only the Chinese way – roasted that is. MM, what a clever twist to adobo! The Ilocano style adobo is almost dry because the very last step before serving is to fry the meat in hot oil to brown it. Wet stuff in hot oil = messy messy messy YUCK – I’m sure that’s what started the dirty kitchen concept. My adobos are on the blonde side for the simple reason that I don’t fry indoors if I can help it. But grilling – what a simple but really effective alternative. I’ll need to give this a try. THANKS! Oh MM, you wouldn’t believe this, I am 12kgs overweight now! Must be the duck’s fault..hehe..
nice adobo! soo inviting. have you tried sizzling adobong balut? i love duck! i always enjoy my peking duck – the meat, more than the skin, and duck misua soup with the chinese herbs(sibut). lately, i’ve enjoyed tea-smoking ducks before roasting, or doing a chinese adobo with sea cucumber and pork litid. what i miss most is the duck rice sold in singapore’s hawker stalls with the fragrant yam rice. dapitan market carries duck and quail in the same stall that offers freshly dressed chicken. but sometimes, the duck breast is rather small. i’m looking for a duck seller that offers duck with meatier breast meat. any ideas? To Kayenne Only: Where do you get your Chinese herbs – SIBUT? Greatly appreciate it you can share that info. Thanks much in advance. I bought frozen ducks here in my plcae almost 600 pesos each for 2 kilos, “Gi mingaw na gyud kog patotin” bahalag mugasto ko og daku.. but I used pineapple and sprite only kay walay tuba diri.. cge nalng atsup lang gyapon.. and I invite friends dali ra kau mahorot..
Commissioning a 30 Year Old Unfinished Nuclear Plant?! ?